Hello, hello! And welcome to the new home of a farmgirl’s dabbles! Isn’t it lovely?! Thanks to the uber talented team (Lindsay & Taylor) at Purr Design, we now have this fabulous new space to call our own. And I couldn’t be more thrilled! Please take some time to look around the place. We’re still wiping off some of the construction dust, and have a bit to tidy up. But mostly, everything’s in great shape. If you can’t find something, just holler! 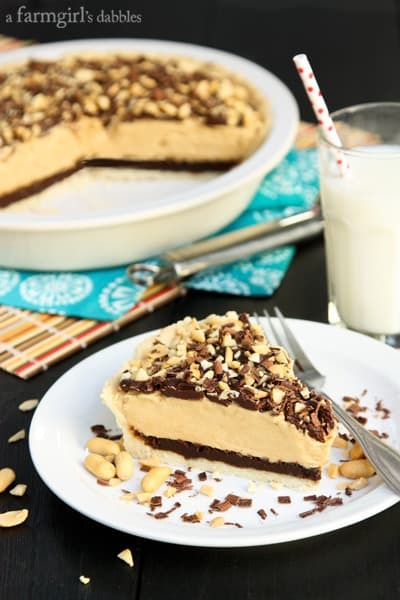 And then, my friends…sink your eyes upon a piece of this Peanut Butter Pie with Mississippi Mud Fudge. It’s one of those treats that will have everyone fighting for the last piece. Well, at least that’s what happened around here! Peanut butter pie has been on our agenda since July, when I took our girls and one of their friends to pick blueberries over in Wisconsin. As is our tradition when we’re done picking berries, we headed to the quaint little village of Stockholm for lunch on the shady patio at Bogus Creek Cafe & Bakery. And then we walked across the street to The Stockholm Pie Company, where the pies are made fresh each day and completely from scratch, with flaky tender crusts and scrumptious fillings. Just like Mom makes. Really, they’re that good. 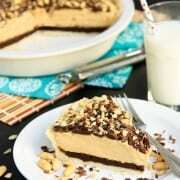 It was there that we shared a gigantic piece of their amazing peanut butter fudge pie this past summer. And it was then that we fell in love, and knew we needed to recreate this masterpiece at home. 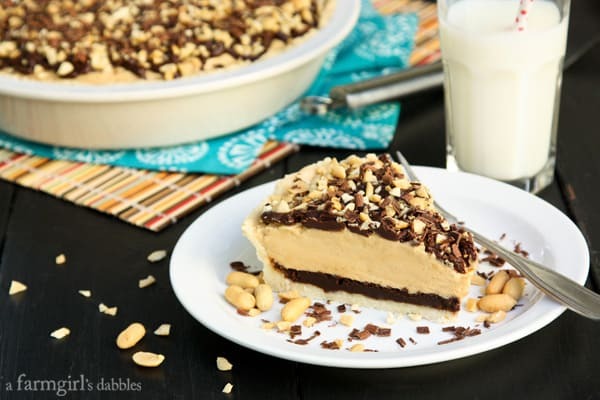 I found a recipe for my grandma’s peanut butter pie in my recipe box, so that’s what my own peanut butter filling is based upon. It’s thick and creamy, and oh so wonderful. Then I added a layer of dark fudgy brownie below it and, unlike the pie in Stockholm, added a good amount of espresso powder to the brownie for a nod to Mississippi mud pie. Oh how I love that chocolate and coffee flavor combo! 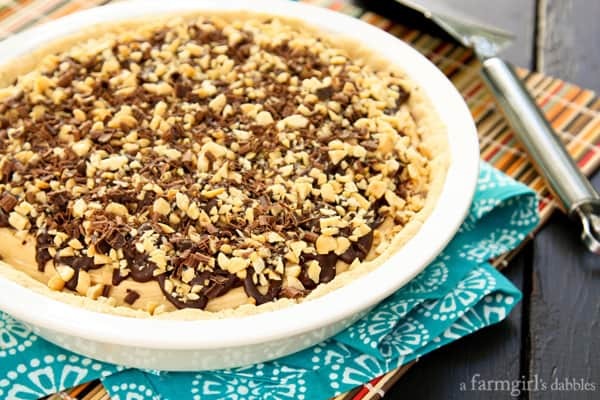 The pie is baked up in an easy pressed-in crust and topped with a heavy drizzle of chocolate glaze, and then a sprinkling of salty chopped peanuts and dark chocolate curls. I’m really not kidding when I said there was a battle for the last piece. This recipe’s a keeper! Preheat oven to 325°. Combine the flour, sugar, and salt in a medium bowl. With a pastry blender, cut in the butter until crumbly. Then quickly mix with hands until it forms a dough. Don’t worry if it seems a bit dry. Press dough evenly onto the bottom and up the sides of a 9″ pie pan. Aim for a uniform thickness on all surfaces and don’t press the dough in too hard. Bake the crust for 15 to 18 minutes, or just until lightly browned. Set on wire rack to cool. Leave the oven set to 325°. In a small saucepan over low heat, stir the butter and chocolate until chocolate is melted. Remove from heat and whisk in the sugar, and then the egg. Then add the espresso powder, vanilla, and salt, and whisk again. Sift the flour over the chocolate mixture and stir to blend well. Spread evenly over pie crust and return pan to oven. Bake for 18 minutes, until the chocolate layer is slightly puffed and dry-looking. Let cool completely on a wire rack. In a medium bowl with an electric mixer, whip the cream until stiff. In a separate medium bowl, beat the cream cheese until smooth and then beat in the peanut butter and butter. Add the powdered sugar, vanilla, and salt, and mix until smooth. Gently fold in the whipped cream until the mixture is consistent. Spread peanut butter mixture evenly over the Mississippi mud fudge brownie layer. Create a chocolate glaze by combining cream and chocolate chips in a small saucepan over medium-low heat. Stir constantly until chocolate is melted and mixture is smooth. Cool for 10 to 20 minutes, stirring occasionally until glaze is thickened, but still pourable. Stir chocolate glaze until completely smooth, then drizzle over the top of the peanut butter layer. Immediately, sprinkle with chopped peanuts and dark chocolate curls. Place pie in refrigerator to set. It is best to let it chill for at least two hours before serving. From a farmgirl’s dabbles, with help from Grandma Renelt’s recipe box and inspiration from The Stockholm Pie Company in Stockholm, WI.